St. Benedict, founder of the Benedictine monastic order and father of much spiritual wisdom and practice wrote, “always we begin again.” After having not eaten very well for the past couple of weeks I am especially eager to begin again, and the best place to start is with breakfast. Breakfast is like the opening music for a movie–it sets the tone for everything that will come after it. If you want to be healthy you have to eat a healthy breakfast. I’m not just eager to eat better, I’m fed up with eating poorly. I don’t feel as good as I should, I can’t think as clearly, and I’m putting on weight that just doesn’t belong. Luckily for Eli, when I get healthy, he gets healthy too! Thus, in addition to planning a week’s worth of healthy and delicious meals, we have also begun a new exercise routine–running. In any case, a healthy breakfast is key and this is one of my very favorites. Since you are probably reading this mid-day, you should make up your rice tonight for an even quicker breakfast tomorrow. Cook your brown rice according to the instructions. 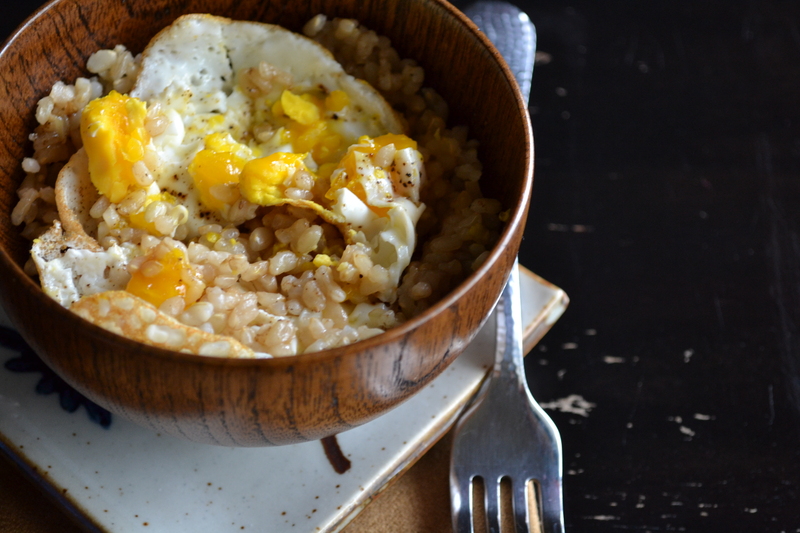 If you have already cooked your rice, heat about 1/2 – 1 cup of it up in the microwave and keep hot while you cook your eggs. To fry your eggs, heat a small frying pan over medium heat. Spray the hot pan with cooking spray or coat with a little bit of olive oil. 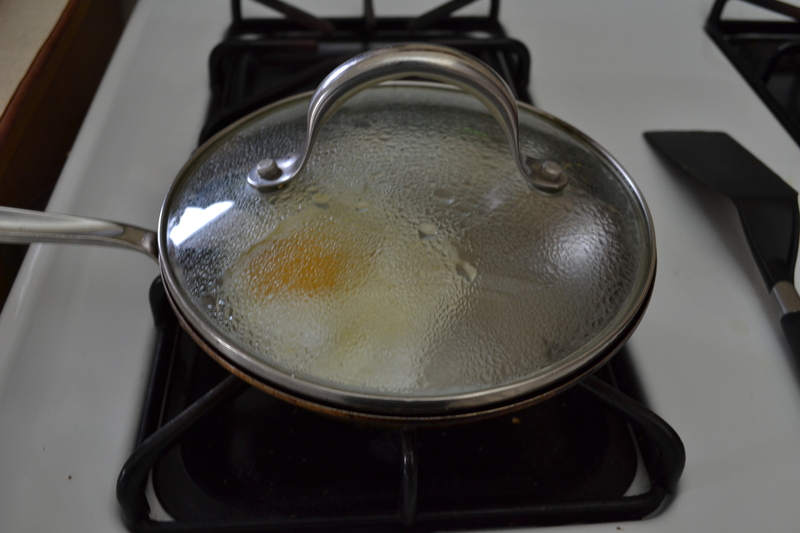 When the oil is hot, pour your cracked egg(s) into the pan and let set up for about a minute. Sprinkle with salt and pepper. Once the whites have just begun to set, pour about a teaspoon of water into your pan and quickly cover the pan with a tight-fitting lid so the top of the egg(s) is(are) cooked by the steam. This only takes a couple of minutes, so stay close to the stove so you don’t overcook the yolks–unless you like them firm. I like my yolks as runny as possible so they cover the rice when broken by the fork, but I hate runny egg whites. 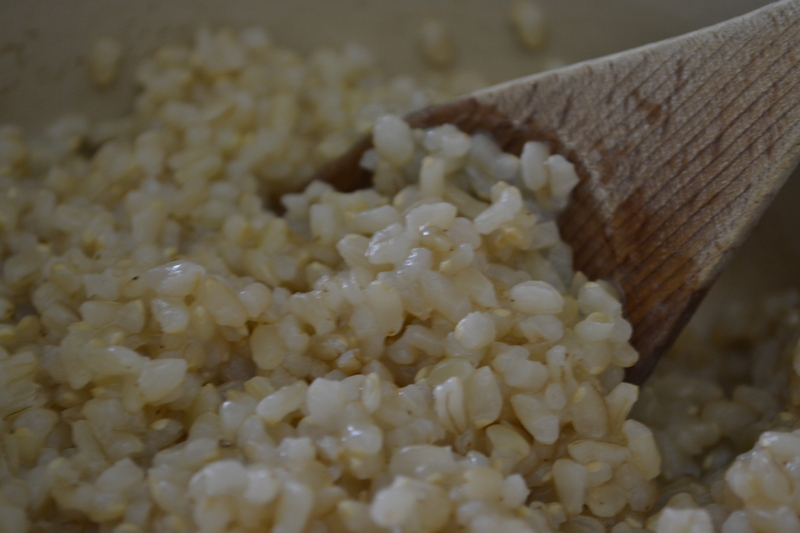 Drizzle some soy sauce and olive oil over your hot rice and give it a generous grind of fresh black pepper. 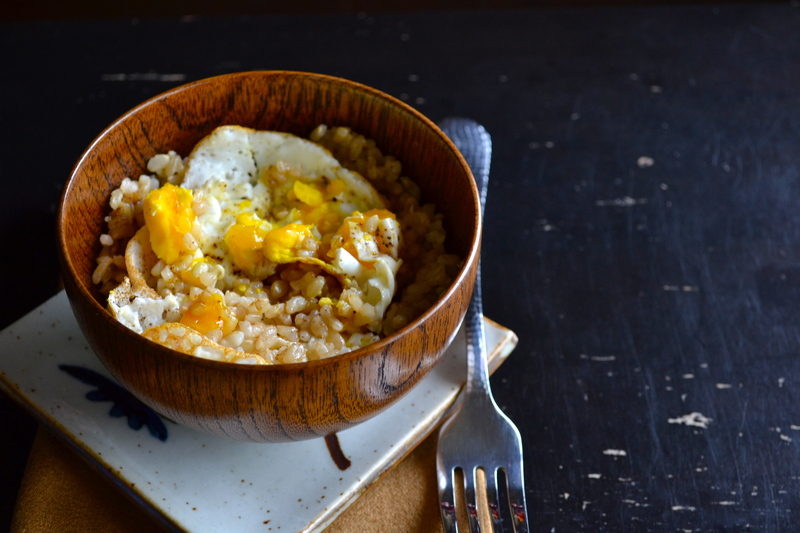 With the fried egg atop the rice, cut the egg up with a knife or even just the side of a fork to break it up and spread the yolk over the rice. Best served piping hot, so if you are serving more than one person, cook all the eggs at once in a larger frying pan. and I’m going to be making this soon! Wow! I couldn’t stop laughing when I saw this post because I eat this for breakfast all the time (I usually use butter instead of olive oil cause I’m bad) and everyone thinks its gross. I call it my ‘asian breakfast’ because it makes me feel asian (I am the whitest asian ever) and it lets me practice my sick chopsticks skills. It really is a perfect breakfast! I’ve never tried it with butter, but I don’t think there’s anything with butter in it that I haven’t liked. Give it a try with the olive oil. I think it’s pretty awesome that way. I’m even badder!! I use bacon fat to fry my eggs! mmmmm good but I suppose oh those poor arteries! GOOOOOOOOO BRIN! you can do it! Thanks! Just put one foot in front of the other, right? That looks really delicious and I absolutely adore your bowl – it’s fantastic. Thank you. I bought the bowl at my local Asian market–you never know what you’ll find at those little markets. All you need now is a set of chopsticks! Chopsticks would have been an obvious addition, and I thought about it, but breakfast just isn’t the time of day when I can adequately handle a pair of chopsticks while trying to feed myself in a hurry. Maybe the next time I eat it for lunch. We love you, chopsticks or not!! !